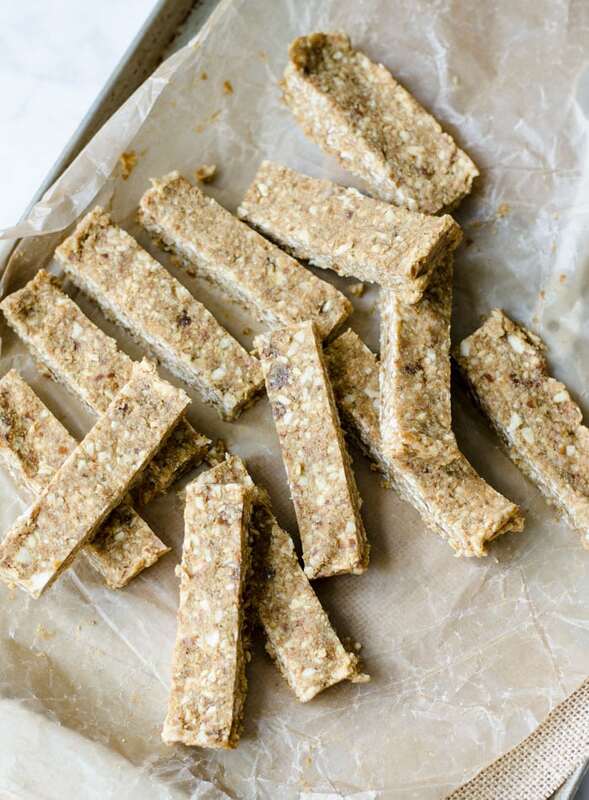 These No-Bake Healthy Snack Bars are a treat made in tropical heaven. Plus with just 4 simple, everyday ingredients you can be enjoying this yummy snack in no time. All you need to make them is coconut flakes, vegan vanilla protein power, banana and dates. They’re energizing, delicious and tasty enough for dessert but healthy enough for breakfast. I’m in love with the sweet, tropical flavour and even more in love with how easy they are to make. 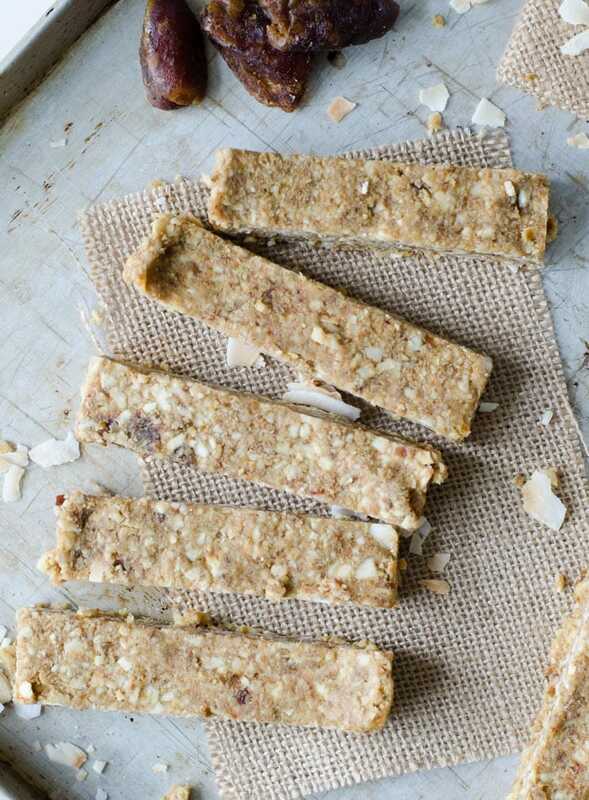 This is totally optional but for even more coconut flavour in these bars, try toasting the coconut first! Or you can buy toasted coconut if you can find it and save yourself the step. To toast coconut flakes, simply place them on a baking sheet and toast at 325 degrees for 5-10 minutes. Watch them carefully as they’ll toast quickly and can easily burn. That’s it! Toasting coconut brings out so much coconut flavour so if you’re a coconut lover, give it a try! 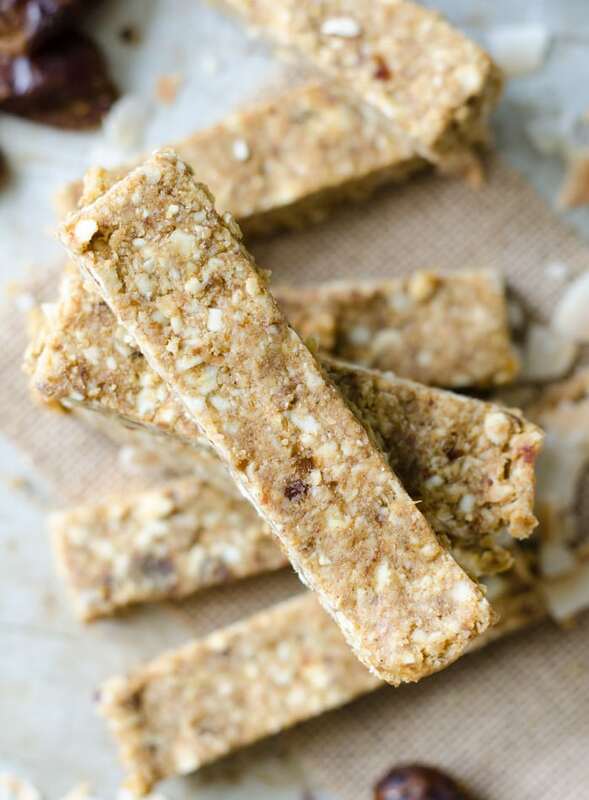 I loved toasted coconut in these Paleo Coconut Bars with Hemp Seeds too. Sooooo goooood. 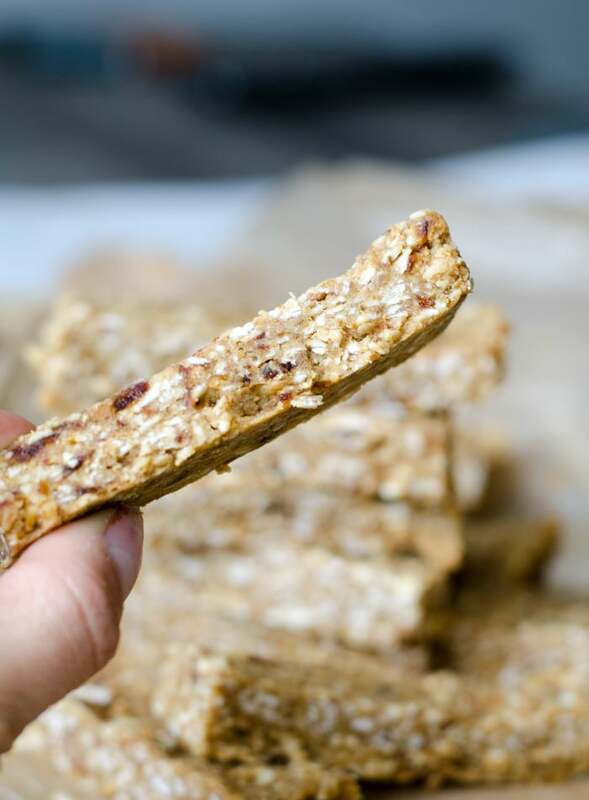 Easy no-bake snack bars are my favourite things to make because you can make endless delicious varieties, no baking required. Plus, if you have a well-stocked vegan pantry, you always have what you need to make them. I like including one or two no-bake recipes in my weekly meal prep so I’m always ready for snack attacks during the week. When it comes to plant-based eating, I find a lot of people get stuck with snacks and can end up relying on store-bought options. No big deal, there are a lot of great brands out there with healthy snacks theses days however vegan snacks are so easy to make at home too. Hummus and veggies or crackers – easy and classic. Any chopped, fresh veggies work. Go with homemade hummus, it’s so easy! Tahini (or other nut butter or coconut butter) stuffed dates – one of my all-time favourite 2 second treats. Tahini stuffed dates all day long. Apple cookies – slice an apple into rounds and top with almond butter and sprinkling of cacao. You can also make an apple sandwich with peanut butter and chia seed jam slathered between two apple rounds. Pumpkin bowls – loving these right now! Add some pumpkin puree to a bowl and top with tahini, cacao nibs, coconut, hemp seeds, sliced dates, banana and anything else you can think of. Pumpkins are loaded with nutrition so this is a great way to enjoy a treat and get plenty of nutrients too. Quick trail mix – grab anything and everything from the pantry, stick it in a bowl and nosh away. Think nuts, seeds, dried fruit, dates, cacao nibs, toasted coconut and whatever else you can find. Protein pudding with fruit and nuts – add a little vegan protein powder to a bowl, mix with just enough water to form a thick pudding, top with your faves like fresh or frozen fruit, banana, apple, nuts, seeds or coconut. You can also try my chia protein pudding. 2 Ingredient Cookies – mash some oats and banana together to form a thick dough, shape into cookies and bake at 350 for about 12 minutes until firm. You can also use my recipe for Flourless Peanut Butter Banana Oatmeal Cookies, Sweet Potato Coconut Oat Cookies or Healthy Pumpkin Oat Cookies. Vegan ranch dip and veggies – use my recipe for vegan ranch dressing, slice up some veggies and dig in. Roasted veggies and tahini – I always make loads of roasted veggies for food prep so I’ve always got some on hand, add some roasted veg such as broccoli or brussel sprouts to a bowl and top with tahini, sea salt and lemon. Quick herbed yogurt dip – mix plain dairy-free with fresh herbs like dill and parsley, add a little lemon, ACV, garlic and sea salt and use as a dip for fresh veggies. Although I’d always like to snack on sweet things, I try to make at least one of my snacks veggie-based. Snacking on veggies is a great way to get more nutrition into your diet. I like to cut up lots of veggies for food prep, think carrot sticks, celery sticks, sliced bell peppers…so I’m more likely to eat them during the week. I’ll usually make one dip too, such as pesto, hummus, herbed yogurt dip or cashew ricotta to go with the raw veggies. When you’re dreaming up snack ideas, try to think of ways you can include all three macronutrients, fat, carbs and protein, with every snack. Balanced snacking will prevent spikes in blood sugar and keep those energy levels stable until your next meal. 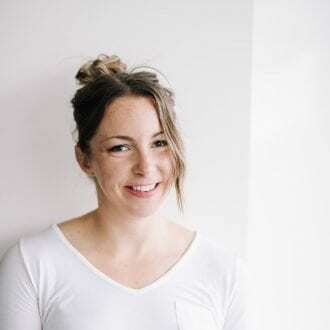 An exception to that is before workouts or during a long hike or something when you need immediate energy, in that case, reach for those carby snacks like Cinnamon Energy Balls, Vanilla Espresso Date Energy Bars or Vegan Peanut Butter Pretzel Energy Bars. 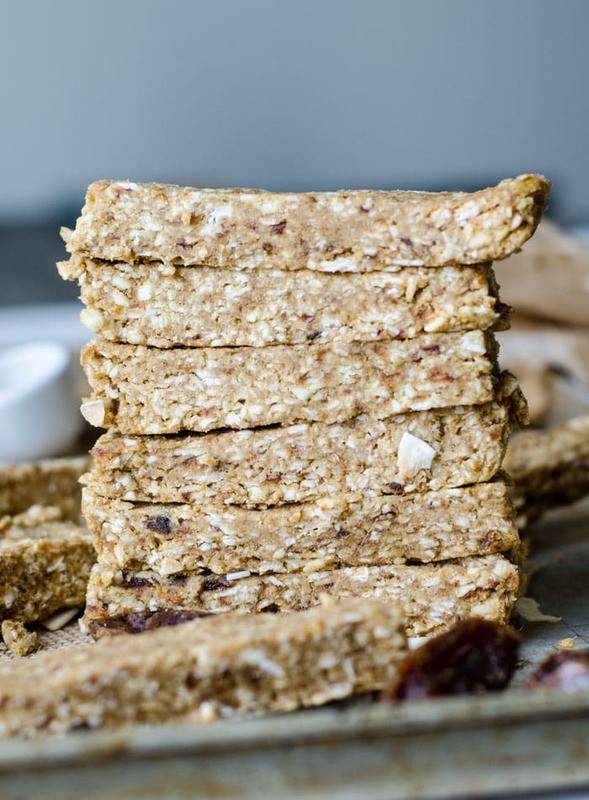 If you love tropical flavours like banana and coconut, then these are the yummy, healthy snack bars are for you. If you love super easy, quick treats than only require a couple ingredients, then these are the bars for you too. coconut flakes – toasted if you want! That’s it! Easy as can be. They’re also vegan, no-bake, gluten-free, grain-free and tasty as heck. Each bar comes in at 136 calories with 14.7 grams of carbs, 9 grams of fat, 3.2 grams of protein and 3.2 grams of fiber. They’re higher in fat from all that coconut goodness which is nice because it balances out the carbs from the dates and banana. I cut mine into 16 squares but you could go for larger bars and double the nutritional info. The dough can also be rolled into energy balls if you want! 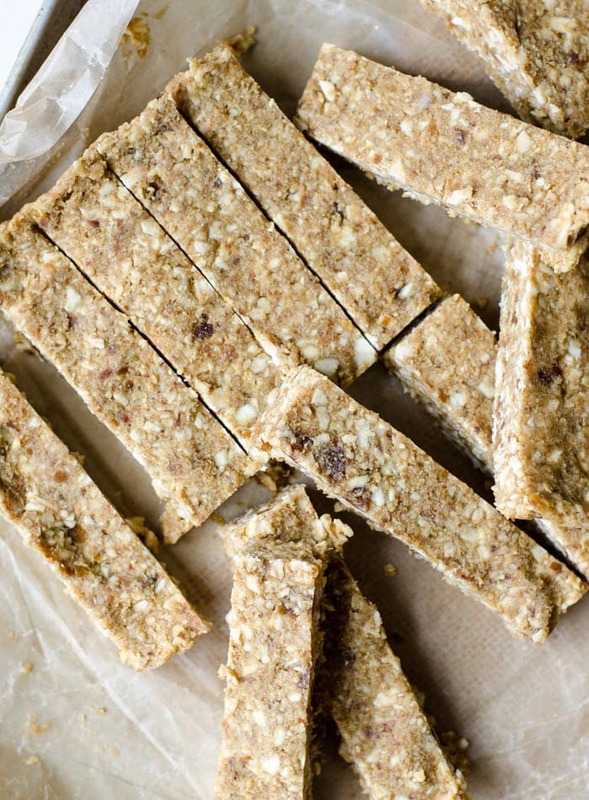 These tropical snack bars call for just 4 everyday ingredients. They’re vegan and grain-free and you will love the delicious coconut banana flavour and soft, chewy texture. Add all ingredients to a blender or food processor and mix until it forms a thick dough. Press the dough into a parchment, wax or saran-lined 8×8 inch square baking dish. Let set in the freezer for a couple hours then lift out of the pan and cut into squares. I love this simple flavor combo and the ingredients! Wishing I had a couple extra minutes to whip some up today to take north for hiking. these look awesome – i especially love how nutritious they are, and how perfect they are for traveling, since they are so portable. These look delicious! I love banana. mmmmm! You are singing my tune with these energy bars! The tropical flavor combo of banana and coconut really appeals to me and I think toasting the coconut first would make it even better. I love to make bars and bites with protein powder myself so I’m glad that is included. This looks so good. I can’t eat bananas though. They hurt my tummy. What could I substitute them with? You could try with applesauce, pumpkin or maybe sweet potato but I haven’t tried it. I think you’d need a bit less applesauce or pumpkin since it would be too wet though. These bars look great! Thanks for sharing. I bet these are delicious, coconut makes everything smell and taste like you are on a Caribbean beach! Plus, a great snack that is healthy and nutritious! Ohh myy goodness Those energy bars look delicious and did I just spot my fav fruit? Dates! I love them packed full of sugar though! Saving this for weekend baking! I don’t follow a vegan diet but I try to avoid eating meat as much as I can and stick to veggies and fruits. I think these are all awesome snack ideas to try! They’re healthy, all natural and tasty as well! These look amazing and are a part of my favorite foods all combined into one!!! I can always use an energy boost! This combination of ingredients sounds like the perfect choice! This just looks so delicious. 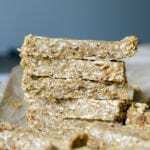 I would have loved to have made my own energy and snack bars but never knew how. I think this would taste delicious. I love coconut and bananas. I’m on a health kick right now so I may give this a try. The Quick herbed yogurt dip sounds really good. Well these look delicious! And I love recipes with fewer than 5 ingredients and only 1 bowl. On my list of recipes to try for sure! Awesome Erin, let me know what you think! Awesome idea. Really want to try these.